I've finally finished the writing and production of the Third Edition of my book, Mastering Regular Expressions (published by O'Reilly Media). I'd been working on it since the early fall, and finished the day before my travels started earlier this month. This third edition is 58 pages longer than the second edition, and now reaches 542 pages in length. The main changes from the second edition are a new, 48-page chapter on PHP, and a rewritten/expanded Java chapter taking into account the many java.util.regex changes between Java 1.4 and Java 1.5/Java 1.6. I've not yet updated the book's web site to reflect MRE3 changes, but I'll get around to it before the book hits the stores (which should be around the end of next month). Would it be possible to “give” a free update to people (like myself :-p) who owned the second edition? Congratulations and good luck. Couldn’t O’Reilly change their ways a little a put a bikini model on the cover to boost sales? The bikini could have valid RegEx code all over it. Days and days of relentless rain (including Gion Matsuri) have given way to searing heat down in the valley. Don’t you wish you were home? I can’t hardly wait for the this 3rd edition of a great must-have-in-your-shelf book! You indicated end of august above, but when I’m made an (pre)order in Amazone(UK) , they are telling me shipping around end of september and delivery in beginning of october. May I hope for a faster delivery? Have you planned a Chinese translation publishing? Delighted to see that you are still active in this area. Not had chance to see the 3rd edition yet, but I certainly will do. If you have not already covered the ksh93 approach to pattern matching/regular expressions, I sincerely hope you will consider this for a fourth edition. I own and enjoy editions 1 and 2, and look forward to enjoying 3. I am in the middle of reading the 3rd edition of your book. Thank you so much for all the effort you put into it – I have never read any other programming or technical book that would be written as clearly as yours. Your goal “to teach a man how to fish” truly stands out! First of all, Congratulations for coming up with such wonderful book. 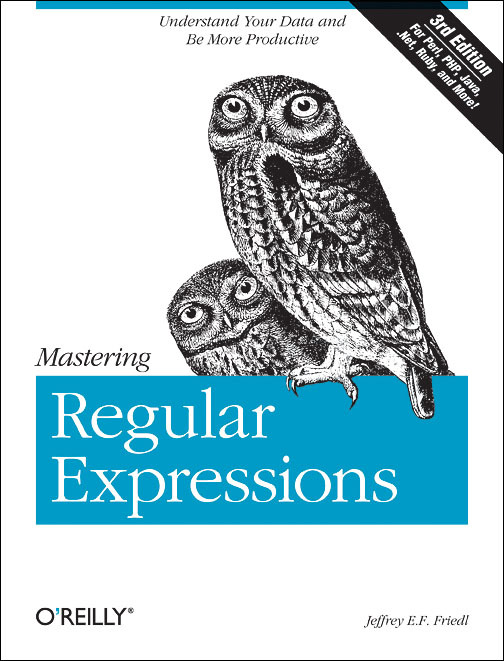 I am referring to 3rd Ed of your book named “Mastering Regular Expression” ( I am never short of humour ). I am just 1 week old in Regular Expression world and trying hard to work my way out. Your book has definitely helped me to understand – Why and what of regular expression. Though I face few difficulties to implement in Tcl. I wonder, why you haven’t included a separate chapter for Tcl. And yes your blog is also very impressive , I like those pictures. And I agree with you about that Japanese (Minister|Moron|Pig). Ahhh the memories. I remember my teacher one day asking me why I carried a book about owls around with me.